Another seamless flow from Beer Friday to Beer Friday on this here un-bikerless plagued blog. With a hard week of nights behind me with a sore leg I am done and wondering what is next? Do I just ride my bike? I was advised not to last time I was off yet I was told to do many other things to help it get better which I did and nothing changed. I think after eight weeks of this I am just going to accept this and just go with it. I mean.. I can still ride right? I just limp when I walk. I'm happy with this... I'll just be that middle aged limpy guy (not that kind!) You know... The one who walks around the local bar with a cigarette clutched in his mouth. Limping across the floor making derogatory comments about his ex wife. I'm on that road kids. It won't be long. It starts with the never endless limping. We poured this honey wheat ale brewed in Canmore Alberta into our trusted Lonebiker Beer review mug and it showed a murky wanting to be gold but not just right there yet beer. It sat in the glass and looked at me and I looked at it. It knew I just finished a hard week on site with a bum leg and I felt the sympathy pouring out of it's suds. 'Drink me' it cried as I looked on. The nostrils enjoyed the honey that was quite evident in this one making the taste buds anxious for a sip. The taste gave a good shot of you guessed it... Honey. Nope! Lots of grains and hops in this one with a honey aftertaste. 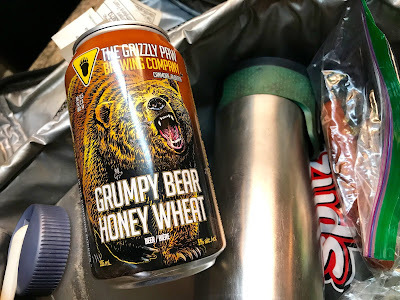 A finely played out tasting in regards in how the honey came in a honey wheat ale, I was expecting an overpowering first shot. Instead it came as an afterthought in a way. Sounds and it is it is actually quite Impressive.